Time for another Read Aloud Thursday over at Hope is in the Word. We're still in Narnia so we'll be talking about that. After we finished reading The Lion, the Witch and the Wardrobe (which I shared about previously) Bookworm1 expressed an interest in reading more of Narnia. I had allowed him to watch the (new) movie version of The L,W,W after we finished reading the book and, with the exception of the scene in which the White Witch kills Aslan, he loved it. (We skipped that part because of the gruesomeness of the creatures in the White Witch's company!) He knows that there are two more movies - one of which involves a sea dragon. He wanted to read Voyage next but I think that particular movie version is far too intense and scary for him at this time. (Plus, I still think that the new version of Voyage is pretty much Narnia heresy in the extreme.) So, I told him I'd read Prince Caspian with him and he could watch that movie. We've since done both. 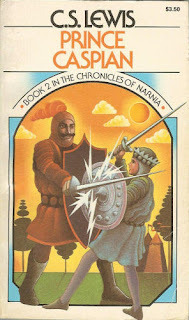 Reading Prince Caspian with Bookworm1 was different than my experience reading The Lion, The Witch and The Wardrobe with him - but I suppose that's to be expected. The time line of the story rather confused him and he had to work a new set of kings out in his mind. 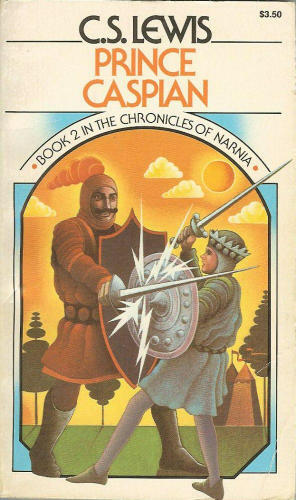 However, the inclusion of mythological creatures, good guys vs. bad and some specific talk about turning to Aslan in times of trouble still held his interest. Raise your hand if you've ever felt confident that God was leading you to do something that was distinctly unpopular? Ever felt like you've received a clear path forward but people are just not getting with the program? And do you ever get wrapped up in your own personal defense to the point of causing further confusion because you felt the need to justify what you firmly believe to be right? I believe this is exactly how Lucy felt and I've certainly felt that way myself. Learning to hold one's tongue is a hard business but I love how Lewis pointed out that as long as Lucy stayed focused on Aslan, and moved her feet forward in the direction he led her, she forgot all the things she wanted to say and simply did what she knew needed doing. She quit wasting daylight. She just moved forward. I would say that this is a timely reminder for me but it's more like the reminder that I need every day! My job in life isn't to follow after the whims, fancies or opinions of others. Nor is it my duty and calling to defend my own actions to everyone around me when I have been impressed by the fact that God is calling me in a particular direction. I could sit around and try to provide detailed explanations but it isn't exactly necessary or healthy. Frequently it just distracts me from what I should be doing. In some ways, it's a waste of daylight. It's a hard lesson. We all want to be liked and understood. It's hard to walk with people who grumble about the plan of action and question you at each and every turn. It's exhausting. So again, we are reminded to keep our eyes on the Leader of the Pack and then our doubts, worries, concerns and need for self-justification will be erased. That's the best place to be: locked in footstep with Aslan. There's truly no where else I'd rather be! This was a lesson that had stood out to me from Caspian, too -- that of following Christ no matter whether others understand or follow. But I had glossed over this point of keeping eyes on Him rather than fussing with the naysayers. Thanks for bringing this out. The question of whom to listen to and whom to ignore is one I struggle with. It seems that often the people who are most emphatic turn out to be the most deluded. Not saying "I told you so" is tough. Knowing what's right AND biting my tongue...tough stuff, but really, what honors God...and what else matters? Well, you already know I love this post. I love the image of your little ones battling it out. . . good stuff! I read this yesterday and was too filled to even comment. So true--following where He leads no matter where he leads and what others think. Love the way you pull these thoughts out of old favorites! Love this post and find it to be spot-on. It can be a challenge to follow 'the leader of the pack' when your entire family does not recognize his leadership. It can be lonely, but your assertion about pleasing others rings true. The one challenge I guess I have here is that sometimes Christians use "I felt lead to...." to justify saying unkind things, or doing what they want to do.